Steve Kemper’s latest book A Labyrinth of Kingdoms tells the story of Heinrich Barth, a German scientist who led a British-backed expedition into the central Sudan. While Barth’s name is not nearly as well-known as Livingstone or Stanley, Kemper makes a solid argument for a reappraisal of Barth’s neglected work. Barth explored Bornu and Sokoto, learned the ways of the nomadic Tuareg people, traveled to Timbuktu, and filled in many of the missing gaps that had been previously left to the guesswork of European geographers. Perhaps most importantly, Barth made numerous cultural connections in his time in Africa. Barth’s story comes alive in Kemper’s capable hands; A Labyrinth of Kingdoms is erudite but never stuffy—at its core, the book is an excellent adventure story. Kemper’s first book, Code Name Ginger, traced the arc of invention and commerce by telling the story of the creation of the Segway transport. His work has also appeared journals like Smithsonian and National Geographic. To find out more about A Labyrinth of Kingdoms, check out Kemper’s blog . Kemper was kind enough to talk to me about his book and Barth’s life in a series of emails. A Labyrinth of Kingdoms is new in hardback from W.W. Norton on June 25th, 2012. Biblioklept: What drew you to the story of Heinrich Barth? What made you want to write A Labyrinth of Kingdoms? Steve Kemper: I got interested in Barth when I read a couple of paragraphs about him in Ryszard Kapuścińksi’s The Shadow of the Sun, a book of dispatches about Africa. In Timbuktu, Kapuścińksi notices a plaque on a house where Barth spent many months in 1853-1854, and he calls the explorer “one of the greatest travelers in the world” for his five years exploring the Sahara. He says that Barth survived death many times, including once by drinking his own blood. 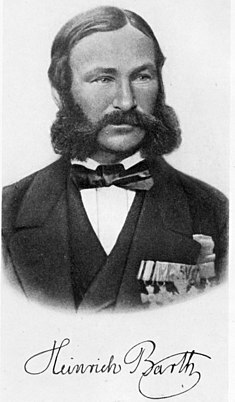 Kapuścińksi added that despite Barth’s accomplishments, he died young, unappreciated and almost forgotten. All of that sounded like the bones of a great story. Biblioklept: Obviously, Barth’s tale is a great adventure story—but what are his greatest accomplishments? SK: One of the reasons Barth isn’t better known is that he didn’t return with a headline accomplishment—the source of the Nile, a traverse of the continent, the location of a lost explorer. He did “discover” the Benue River and showed that it flowed into the Niger (that river’s major tributary) rather than into Lake Chad, and he settled the exact location of Timbuktu. But the reason that his work remains important to scholars is that he came back with reams of invaluable information and data about geography, anthropology, ethnography, and languages. He traveled across an immense territory and spent time with the major peoples of north-central Africa—Hausas, Kanuris, Tuaregs, Arabs, Songhais, Fulanis. The material he collected is still relevant. That can’t be said of most of Barth’s more famous peers. But then as now, headlines are more likely than scholarship to capture the public’s attention. Biblioklept: North Africa, and the Islamic world in-general have captured more of the Western public’s attention in recent years though—what can we learn from Barth’s travels and experiences? SK: Many things. First, that the region and the religion are not monolithic. Barth’s work (and my book) are full of a tremendous variety of peoples and cultures. Most Westerners—and I include myself in this, prior to writing this book—have a vague, fuzzy, and simplified image of the region that distorts everything about it—its many cultures, its complicated history, its complexity. Barth returned convinced that Islam was a great religion—not a popular view, then as now—but added that in some places it had been hijacked by thugs who used it as an excuse to pillage non-Muslims, or by fanatics, who used it as an excuse to kill or enslave non-Muslims. This still sounds familiar. But he also added that Islam wasn’t much different in this way from Christianity, another great religion sometimes hijacked by the greedy or the self-righteous. Barth met Muslim scholars and Muslim thieves, and tried to be clear about both. I could keep typing on this subject for a while but I don’t want the answer to get too long. I plan to write a couple of op-eds on the subject in time for the book’s pub date. Biblioklept: In A Labyrinth of Kingdoms, you point out that Barth’s open-minded ideas were not well-received by his contemporaries, in part because these ideas conflicted with the emerging age of imperialist Europe. Is this also one of the reasons he hasn’t been canonized like other explorers? SK: The short answer is yes, I believe so, though there are not straight lines connecting the two. But it seems clear that Barth’s ideas at least contributed to the reception of his work, along with Britain’s changing commercial and political goals, the interests of the public, and Barth’s own difficult personality. Biblioklept: In what ways was Barth a difficult personality? Another part of Barth’s difficult personality stemmed from his sense of high calling. He truly did devote his life to science and the pursuit of truth, and he could be harsh when lesser mortals fell short of his standards. It interests me that when he was in Africa, Barth showed far more patience and diplomacy than he did when back in Europe. In Africa, patience and diplomacy were often necessary to accomplish what he wanted and even to survive, but in Europe I think he expected better conduct and sometimes reacted poorly when he was disappointed. Biblioklept: Barth’s story is one of culture and discovery, but it’s also an adventure story—can you share a favorite anecdote about Barth the adventurer? SK: Tough question, since there are so many good ones, including death threats and narrow escapes. But I prefer the ones that reveal something about Barth. So: early in the journey, when he still considered himself nearly indestructible, he foolishly set off on foot one morning, with little water and no food, to climb a distant mountain. He soon ran out of water, got lost, and began to die of dehydration. Eventually he cut his arm and drank his own blood, which didn’t help. The following morning, at the caravan, the Tuareg guides told the expedition’s leader that no man could have survived the long Saharan day and night without water, but they agreed to search for him. Late that afternoon they found him, nearly comatose. The Tuaregs were amazed at his survival. They were also amazed the next day when, even though he couldn’t eat or speak, he rode seven hours with the caravan. This close call was a tough lesson, but Barth took it to heart and learned from it. Another favorite, because it epitomizes how understated Barth always is about his adventures, occurred when he entered Kabara, a village on the Niger River not far from Timbuktu. Barth took up lodgings and was eating supper when a Tuareg warrior entered, glaring, and attempted to intimidate Barth into giving him a fine gift. Barth said he was eating and to go away. The Tuareg replied that he was a very dangerous man who was about to do something terrible. Barth writes, “After a very spirited altercation, I got rid of him.” I love the dry modesty of that. Imagine how Burton or Stanley would have handled it. After Barth expelled the warrior, 200 other men came in and silently eyed the stranger. Barth responded by staring back while lying across his smaller bags and protecting the bigger ones behind him. Very cool. Very Barth. Biblioklept: I ran a blurb of your book the other day and a reader asked if the theologian Karl Barth might be a descendant of Heinrich’s. Any clue? SK: I wondered the same thing, but haven’t come across anything that suggests they were related. Biblioklept: You provide a fairly extensive set of end notes as well as a large bibliography for Labyrinth–clearly a lot of reading and research went into the book. Can you describe how you synthesized the information? What were some of your most important sources? The principal source, of course, was Barth’s colossal book, Travels and Discoveries in North and Central Africa, which was originally published in five volumes and covered nearly 3500 pages. Other crucial primary sources were the extensive Foreign Office files in the British National Archives, which include dispatches from consuls, receipts, letters, and all the thorough bureaucratic documentation of the Victorian age. Barth’s brother-in-law and close friend, Gustav von Schubert, wrote a biography that I had translated; it provided many private glimpses of Barth. The scholarship, of course, was invaluable, and I immersed myself in it to understand the era. Remember, I’ve spent the last 30 years as a journalist, writing about living people. I knew how to write narrative, but I had to learn how to do that with history. My goal with the book was to write an exciting, informative narrative that put readers inside the expedition with Barth, so all the scholarship is all folded into the action. I don’t quote many scholars in the text proper, because I didn’t want to intrude on the readers’ experience of the expedition. That’s all writer’s talk about technique and is probably more than your readers want to know. Biblioklept: Actually, our readers seem to enjoy insights about writing technique, so I’m sure they’ll be interested in this stuff. (I’m interested, anyway). How long did it take to research and write the book? SK: It’s hard to say, because I was also working on smaller jobs while researching and writing the book. The research just for the proposal was time-consuming, starting with Barth’s 3500 pages. Because I’m not a scholar of 19th century Africa or Europe, the background research took many months. The writing, including interruptions from other jobs, took about 9 months—probably 7 months net. Biblioklept: What’s your next big project? SK: I’m working on another book for W. W. Norton about another undeservedly obscure adventurer whom I stumbled across in my reading. An American this time, who lived the sort of epic life that’s no longer possible, on frontiers in several countries. I think I’ll keep his name to myself for the time being. SK: Yes, once, while in college—a paperback of several Sean O’Casey plays. It was also a library book, which I later realized compounded the crime, since I deprived others who could have gotten pleasure from it. I’ve since donated hundreds of dollars’ worth of books to libraries. Maybe I’ve subconsciously been seeking atonement. In college, Kevin Kopelson passed off a paper by his older brother Robert as his own. In graduate school, he plagiarized nearly an entire article from a respected scholar, and then later, having met her and been asked if he would send something for her to read, sent that essay he had plagiarized from her work. This is not to mention the many instances in which he quoted others extensively, not passing their work off as his own, but substituting it for his own words when his words were what were called for. Until recently, such plagiarisms and thefts had been his most shameful secret, shared only with a trusted few. But then Kopelson—now an English professor and the author of a number of respected books, most recently 2007’s Sedaris—wrote an essay entitled “My Cortez,” which was published in the London Review of Books in 2008. It was a satirical literary confession, an exploration of Kopelson’s personal and professional life via his various acts of plagiarism. From that jumping off point and exploring also his other vices, Confessions of a Plagiarist is the compelling and clever retelling (not to mention renovation) of Kopelson’s life, one transgression at a time.